Join us for an evening of festive veggie and vegan goodness and cheer as we celebrate our one-year anniversary of being totally pay-what-you-can. On Thursday 13 December between 19:00 and 22:30, we invite you to our final community pay-what-you-can meal of the year. Eat delicious and healthy food for £1. As you’d expect from the Brixton Pound, it will be far from traditional and the menu will be dictated by the surplus food we receive. Ironically, we’re short on crockery so bring your own plate! Gather with staff, patrons and neighbours old and new, and let’s start the festive season the Brixton Pound way! This entry was posted in Community, Eating Out and tagged christmas, holidays on November 23, 2018 by Madeleine. We’re about to embark on a series of workshops taking place at the Brixton Pound in the lead-up to Christmas. We’re obsessed with pickling and fermenting as active ways to extend the lifespan of fresh food, save money and help diversify diet, and we’re doing a bi-weekly workshop (Wednesdays 7-9pm) demonstrating different techniques. Pay-what-you-can (£20 suggested donation) All materials provided but bring your own jars. Book to avoid disappointment, group slots available Come learn some skills at a session or book Sean to run one at your house, studio or cafe. Email Sean at kitchen@brixtonpound.org. This entry was posted in Events, Transition Town Brixton (TTB) and tagged christmas, christmas presents, workshops on November 8, 2018 by Madeleine. You can now hire the Brixton Pound for catering events: snacks for talks and workshops, hot meals for community meetings, buffets at art exhibitions, one-pots for corporate events. Whatever your budget, let us feed your guests using some of the finest ingredients saved from landfill. Our inventive veggie and vegan menu is inspired by the donated ingredients we receive, and executed by our talented team. We can also deliver on- or off-site workshops for five to 15 people, teaching practical techniques for making dishes from surplus and preserving leftovers. Whether you’d like a pickling workshop, fermentation demonstration or cooking class, we have skills-based learning programmes to suit your organisation. This entry was posted in Eating Out and tagged catering, christmas, surplus food on October 14, 2018 by Madeleine. With the help of local volunteers and donors, the Brixton Pound ran a collection and gift wrapping session at the B£ Café to give isolated older people gifts and treats to help warm their Christmas. A lunch was hosted at the Vida Walsh Centre in Windrush Square on Christmas day for older people who would otherwise be spending Christmas alone. When we think of Christmas we think of warmth and merriment, family and friends, but that’s not always within reach for everyone, whether because of geography, absence of family or friends, physical or mental disability, or other challenges. Older people in particular can find themselves isolated and lonely at Christmas. Previous recipient of a Brixton Fund grant, Age UK Lambeth, asked us whether we could help them in sourcing donations of food and gifts to be distributed at the lunch, so we sent out a call to our network of Brixtonites and other loyal supporters. The response was overwhelming. Thanks to you lovely people, and in particular thanks to staff of Lambeth Council, we received several large bags of fruit, biscuits, chocolate, and assorted gifts. As well as collecting an impressive pile of gifts for the event, with the help of the Lambeth community, Age UK Lambeth managed to raise more than £3,000, massively exceeding the target of £750. The money not spent on the Christmas lunch will be used to upgrade the services they provide for users in Lambeth. To keep up with any Age UK Lambeth updates, events and developments, follow them on Twitter, Facebook, and Instagram. This entry was posted in news and tagged 12 days of BriXmas, age uk lambeth, briXmas, brixton, brixton fund, christmas, community, event, fundraising, Lambeth council, local heroes, local organisation on January 18, 2017 by brixtonpound. The very special Xmas Bonus is on! Buy a ticket for £1 and enter a draw to win B£1,000, or one of 22 runner up prizes – including original B£ merchandise and 12 mystery prizes donated by Brixton businesses this Christmas! Get up to 10 tickets to boost your chances! Proceeds from the Brixton Bonus go into the Brixton Fund, our local grants scheme: so it’s a win for Brixton every time! With B£1,000 in your pocket, you can cover all your Christmas costs: buy gifts for family and friends, groceries, decorations, and any other festive items – all from local, independent shops. For some great ideas, check out gift guides made by B£ users in the previous years, or see what previous Bonus winners spent their prize money on. And while you do your Christmas shopping, treat yourself to a lovely coffee break at Federation Coffee, or a festive cocktail at Seven or Three Eight Four bars. For a full list of B£ businesses, visit the B£ Directory. 12 Days of BriXmas Advent Calendar – win one of 22 very special runner-up prizes! Aside from the Brixton Grand, you’ve got a chance to win one of 22 special runner-up prizes in the Brixton Bonus! We’ve teamed up with Brixton businesses who donated 12 very special prizes. We will announce a new prize every day from 1st until 12th December – keep an eye on our social media, or come see the advent calendar at the B£ Cafe! 2 sessions of mosaics workshop with master mosaic artist Kes Young! Kes will work with you to design and learn to use tools and then grout your own unique piece as part of a chilled group mosaic class at the B£ cafe. Hand made, hand painted jug from Omnis. Free gyoza at Koi Ramen! 24 Christmas cupcakes, a mix of gingerbread, mince pie, and vanilla bean Christmas tree. Boxed and delivered with a big red bow! A Danish 1970s ceramic dish, designed by Bjorn Wimblad. A year’s Friends of the Black Cultural Archives membership! Gives you exclusive invitations to special events at the BCA in Windrush Square, as well as other bonuses including free BCA branded tote bag, 10% discount in the BCA cafe and shop, and priority booking on events. The craftspeople at Studio 73 will expertly frame your beloved print or photo. Bottomless brunch for 2 people at 384 in January! A 2 hour sitting, with any bunch dish and bottomless prosecco, coffee and Bloody Marys. Whew. Candelit evening meal for two at Cafe van Gogh on Brixton Road. You’ll get to sample their gourmet creative plant-based recipes. Have a look at our online shop for more details of each item, and good luck! This entry was posted in news and tagged 12 days of BriXmas, briXmas, BriXmas gift guide, brixton bonus, brixton fund, christmas, christmas ideas, christmas presents, christmas shopping, community, Gift ideas on December 6, 2016 by brixtonpound. Could you donate a small gift for an older person who will be alone over the Christmas period? The winter months are kicking in, and it’s time for mulled wine, carols, festive headgear and parties accompanied by barely tolerable Christmas pop songs. But not everybody in our community is fortunate enough to have friends or family around to enjoy the season with. We’re teaming up with Age UK‘s No one should have no one at Christmas campaign – and you, Brixton residents, B£ users, B£ Cafe customers – to try and bring a bit more warmth to older Lambeth residents this year. Age UK, one of the organisations which received funding from our local grant scheme the Brixton Fund, is hosting a Christmas lunch on 25th December at the Vida Walsh Centre, just off Windrush Square, for older people who would otherwise not have someone to spend Christmas with. At the B£, we’re asking our customers and supporters whether they can donate a small gift, perhaps something you no longer have a use for, something you’ve made, or something bought at a local B£ business that can be wrapped and given as a small token. Please bring your donations to the B£ Cafe at 77 Atlantic Road – thank you! We will also gladly accept any donations of wrapping paper, and if you could offer some of your time to help us wrap the gifts too, we’d be overjoyed. We’re planning to do that at the B£ Cafe on 21st and 22nd December. You can also donate B£s to the Vida Walsh Centre ran by Age UK Lambeth – if you already have a B£ account, you can simply text “pay vida [donation amount]” to the B£ pay-by-text number (07926200421). Or if you prefer donating pounds sterling, you can text AUKL16 £4 to 70070 to give £4 to help buy Christmas lunch for an older person. This entry was posted in news and tagged 12 days of BriXmas, briXmas, BriXmas gift guide, brixton, brixton fund, christmas, christmas ideas, christmas presents, christmas shopping, community, local heroes on December 6, 2016 by brixtonpound. The B£ Shop (at 3 Atlantic Rd) is now also open on weekends – so you can stop by when you’re doing your Christmas shopping. And while you’re at it, why not get some brand new B£ merchandise? We’ve got mugs, tote bags, posters, t-shirts in different cuts and colours designed by This Ain’t Rock’n’Roll, the same guys responsible for the iconic B£ notes – and they all look pretty rocking. And for the notes, we’ve got these cool presentation wallets that make them perfect gifts for just about anyone. As well as a book on punk philosophy, campaign t-shirts from an array of local actions like Save the Arches, Friends of Stockwell Skatepark, Save Cressingham Gardens, and Ritzy Living Wage, plus snacks, drinks, cakes, and other produce from local makers. We’re pretty confident you can find a gift for anyone here, and every sale contributes to the Brixton Fund, and thus supports Brixton and its community. Could you ask for more of a win/win situation? This entry was posted in news and tagged B£ t-shirts, briXmas, brixton, brixton fund, brixton pound, christmas, christmas ideas, christmas presents, christmas shopping, shopping on December 17, 2015 by brixtonpound. This post was commissioned by B£ and first appeared on Chloe’s blog, Made in Brixton. The gift hamper has been around for many years, mostly given at Christmas and is traditionally a gift containing small non-perishable food items, particularly seasonal favourites such as fruitcake, nuts, jams, biscuits, honey, smoked or dried meats, and cheese. Some hampers contain tea & coffee, and might also include a cup and saucer. More often than not these hampers were luxury and contained high-end items such as tins of caviar or bottles of wine. Outside the UK the Christmas hamper is more usually called a gift basket and does not necessarily contain food items. Non-food gift baskets are frequently themed, such as baskets containing luxury bath items including scented soaps and towels, or beauty baskets with skincare products. These gift baskets are also popular for occasions other than Christmas such as baby showers and more corporate gifts where you don’t necessarily know the person that you are giving it to – A Safe gift option. If you ask anyone to name a company that sells hampers they will most likely tell you Fortnum & Mason, Harrods or Selfridges. All their hampers come ready made and although you can pick the theme, the contents are usually fixed. To me this is a bit like the selection box of chocolates, where you like the majority of the chocs but always get left with the green triangles that no one eats. This got me thinking …. What would I put in my hamper if I could choose? I’d choose local produce, handmade items of a crafty nature and I’d look for traceability. As I rarely buy for people I don’t know then I’d like to choose myself and make it personal! 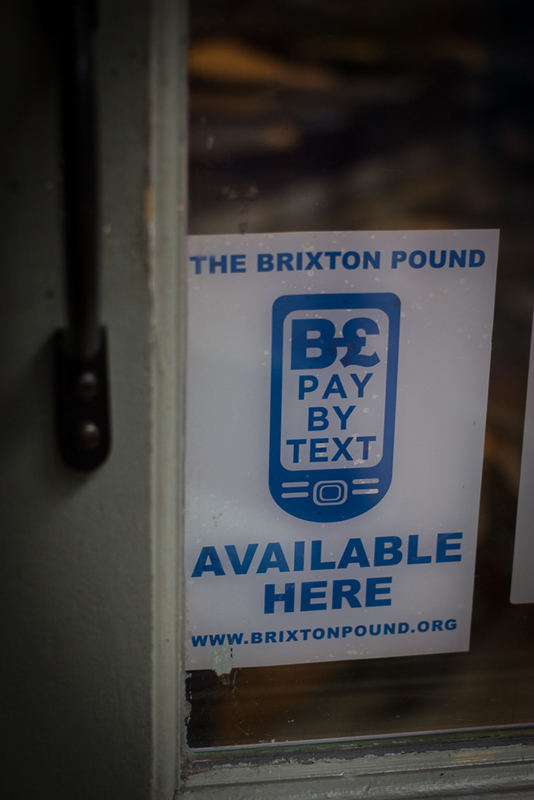 The Brixton Pound was launched in September 2009 as a physical paper-based currency and was followed in September 2011 by the launch of the electronic B£ pay-by-text platform. Around 250 businesses currently accept paper B£ and over 160 have pay-by-text accounts. The Brixton Pound is one of five local currencies that currently run in the UK, and was the first in an urban setting. The others are Totnes, Lewes, Stroud and Bristol and others are in the pipeline. 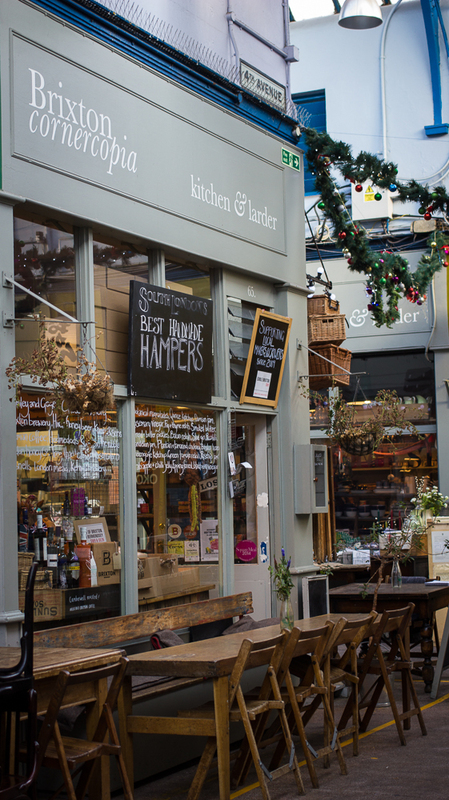 Snuggled away in the heart of Brixton Village, this store already offers a wide range of ready made hampers starting from £26- £47. All the products are sourced locally either in Brixton or in the surrounding areas, and each product comes with its own story: Brixton Chutney made from the village veg, bees from South London for their honey etc. 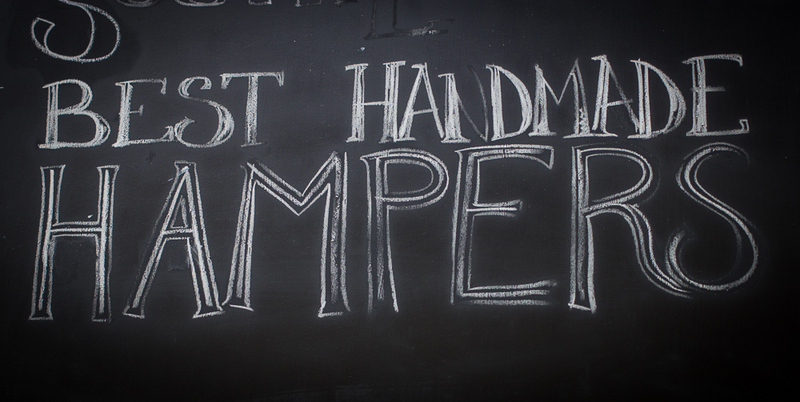 They also sell all the items individually so you can make up your own hamper on site. They have hessian sacks, boxes, baskets, pie tins etc. all of which can be made to your personal requirements. I’d advise you to choose this option and go at a quiet time as it’s much more pleasurable for both you and the staff to be able to take your time with choosing and preparing. The Cornercopia crew are all very helpful and very knowledgeable – they will gladly help you to choose should you need it! You can also choose to buy something separately from the kitchen department of Cornercopia and take it to the cafe to be wrapped with other purchases! Their best selling hamper (unsurprisingly) is the Brixton Village Hamper and they are offering 10% off your purchase with the B£ :-)!!! Knitted reindeer pack – Faux Animals. Comes with Pattern, Wool, and knitting needles £36-45 depending on the animal (fox sells best). Hand made aprons from Peckham by Scobel Clothing (could be for garden or ceramics too 😉 come in various one-off designs and prices. And a huge range of traditional and hand-made stocking fillers from £1-10! Cornercopia have a Christmas shopping event on the 11th Dec, Pop-up Kitchen on Friday and Saturday evenings in December – check their website for full details! Cornercopia take brixton pounds by text as well as cash! It is clear that Cornercopia are all set for fulfilling your hamper needs, whether bespoke or ready-made, but I wanted to see what I could whip up from a willing local retailer who might not be so au-fait with the idea of the Christmas Hamper tradition. A fabulous deli on Atlantic road. You’ll recognise it by the huge variety of fresh herbs and exotic vegetables outside the front. They don’t sell pre-made hampers but definitely fulfil the requirements for making up your own and it was the perfect place for me to try some hamper experimenting of my own! I took down my own hampers and the co owner José Cardoso helped me to put together some themed gift hampers for my friends and family…..
Lots of classic Italian biscuits and nougat – the perfect dinner party gift! Fresh chestnuts and Quince and all your other stockingfiller and Christmas dinner party needs. They take B£ in cash only. A new addition to the Brixton family – this cafe is right at the end of the string of shops on Atlantic road. They serve fresh cakes and meze style breakfast lunch and dinners all cooked on site. Not the most obvious of Hamper making venues but they have some fabulous take away and made to order options! The owner helped me to make up a few hamper options with his delicious selection of hand make cakes and biscuits. NYE party details TBC but keep your ears open for details and tickets! So! It turns out you can make your own hampers & gift boxes and support both a local currency & local businesses all at once! It’s a great way to give unique gifts, do some good doing it and have a lot of fun finding gift ideas in some sometimes unlikely places. It makes the whole event, well – a bit more of an EVENT! Happy hampering! This entry was posted in news and tagged 12 days of BriXmas, briXmas, BriXmas gift guide, christmas, christmas ideas, christmas presents, christmas shopping on December 24, 2014 by brixtonpound. There’s a picture going around on the internet showing Santa Claus in full regalia, pushing his sleigh filled with presents into a landfill, and the workers looking on comment: “He’s cutting out the middle man.” A bit harsh? Christmas is without a doubt the most wasteful time of the year, in terms of time and money, but also actual physical waste. The pressure to buy is enormous, to the extent that it’s near impossible to avoid. Try suggesting to your family that instead of gifts you’d like to receive donations to a charity of your choice this year, and they will probably be somewhere between bewildered and offended. It doesn’t have to be this way. We shape the customs we follow, and more and more people every year are opposing the mindless consumerism promoted by the media from the start of October. On the one hand, Black Friday’s shopping craze seems to affect the UK more and more each year, but on the other there are campaigns like Amazon Anonymous, asking people to not use Amazon until they pay their workers a fair wage, which already attracted so many sign ups that an estimate of the money NOT spent on Amazon this Christmas is currently £2,592,570. There’s other ways than boycott: in Brixton, every year people are pledging to shop locally, supporting independent businesses and reducing their carbon footprint. According to research, money spent locally will circulate in the local economy up to three times longer than money spent in big chains. And if products are sourced and made locally, the environmental impact is significantly lessened. If that sounds a bit academic, there are many others reasons why Brixtonites have chosen to make their Christmases Brixton-focused. Shopping locally gives residents an opportunity to find food and gifts that are unique to their area – it’s opportunity to discover the wealth and quality of what we have on our doorstep, and what we may miss in busy everyday lives. People are consciously making the decision to think about where their money is going, and to support their local community – to take from it but also give something back. Shopping in smaller shops is also a more personal experience. Overall, it seems like a great way to do some good deeds, enrich our lives as well as those of others – in a time when that message is often obscured by corporate interests. This post was written for and appeared in the December issue of the Brixton Bugle – get your copy if you’ve not got one yet! This entry was posted in news and tagged 12 days of BriXmas, briXmas, christmas, christmas ideas, christmas presents, christmas shopping on December 13, 2014 by brixtonpound. This is a guest post by Kaylene Alder, a freelance illustrator and screen printer living and working in Brixton. She is a frequent contributor to the Brixton Blog and Bugle, so you have probably already seen some of her work! She also illustrated Miss South‘s Recipes from Brixton Village, and sells prints and cards on Makerhood, in her Etsy shop, Studio 73 in Brixton Village and Diverse Gifts. Kaylene is open to any and all illustrative projects – get in touch with her if you want some drawings! So I should say, before I begin, that this was a tricky tricky task. There are SO many lovely shops and things in Brixton that narrowing it down to 5 was most challenging. Ok, I know, socks for Christmas – not generally thought of as awesome… but these are BAMBOO socks. They are like hugs for your feet! Warm in the winter, cool in the summer… I could go on. In aces patterns and colours, these delights by Braintree Clothing can be purchased for your Brixton Pounds at The Keep for £4.90 each or 3 pairs for £12.00. Something framed from Studio 73. With all manner of amazing originals and prints by local artists and an in-house framing service, giving the gift of art is made properly special by Adrian and his lovely team. A3 frames start from £29. This beautiful silver and walnut hammer pendant necklace is made by Daniel Darby can be found at Brixi and bought for someone who is tough and delicate and deserving for £110. I find it tricky to resist the nostalgia of wooden toys. This toy train made from bobbins and other machinery parts from former weaving mills in the north of England can be found at Diverse, amongst loads of other good stuff. It’s £45 but will be around for generations of littlees. While I was imaginary shopping with an imaginary budget, I thought ‘Why not go all out?’ Look! She’s pretty and shiny and Christmassy green! And she’s on sale, down from £1100 to £935. But think of the savings on petrol! And the environment! And the health of the lucky recipient! You can pick her up at Brixton Cycles where the lovely, approachable, deeply honest staff can tell you all about the technical ace-ness of this bike and not just about how shiny she is. If you don’t happen to have an imaginary budget, they do have two-wheelers which are lower in price. This entry was posted in news and tagged 12 days of BriXmas, briXmas, BriXmas gift guide, christmas, christmas ideas, christmas presents, christmas shopping on December 11, 2014 by brixtonpound.